I have an article coming out in the Spring issue of the Journal of Musicology. Here it is! Andre Mount, “Grasp the Weapon of Culture! Radical Avant-Gardes and the Los Angeles Free Press,” The Journal of Musicology 32.1 (Spring 2015): 115-152. 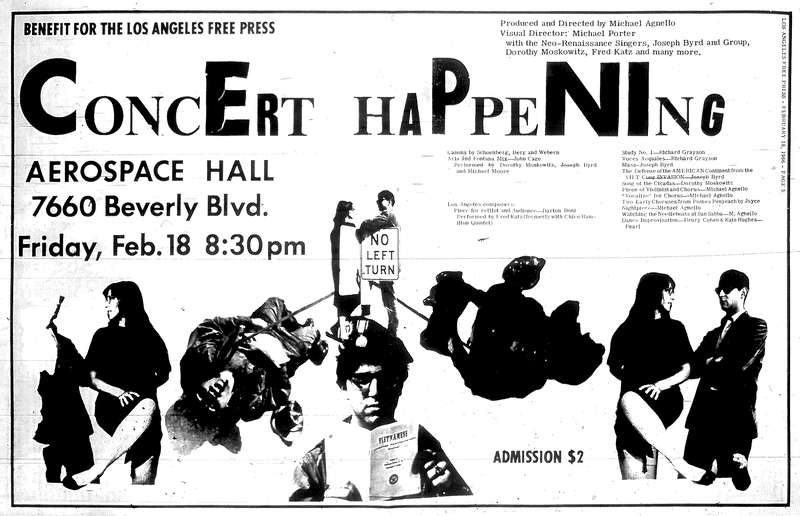 In the 17 June 1966 issue of the Los Angeles Free Press, members of a group calling themselves the Los Angeles Hippodrome advertised an upcoming event: an “Homage to Arnold Schoenberg.” The ad seems to suggest nothing out of the ordinary: a recital of the composer’s complete piano works along with a slideshow of his visual art and the playing of a recorded lecture. The facing page, however, paints a very different picture. There, the Free Press reproduced a series of manifestos written by the event’s organizers. The manifestos range in content from lengthy ruminations on the death of art to a cartoon of a dog-like creature brandishing a knife and poised to cut off the head of a snake above the words “GRASP THE WEAPON of CULTURE!” With their absurdist humor and heady, abstract proselytizing, these statements stand in marked contrast to the refined poise of the music of the Second Viennese School. To address this incongruity, one must look beyond the Los Angeles Hippodrome to several other closely related communities. Dorothy Crawford (1995) provides an invaluable account of one such group in Los Angeles, focusing primarily on a circle of modernist music enthusiasts who organized and attended the Monday Evening Concerts series. 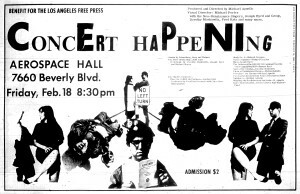 But the individuals behind the “Homage to Schoenberg” were in equally close contact with participants in the Freak Movement, a Los Angeles manifestation of the 1960s counterculture led by iconoclastic rock guitarist Frank Zappa. Despite superficial differences, the political affinities and geographic proximity of these groups facilitated a free transmission of values and ideas that blurred the boundaries between them.